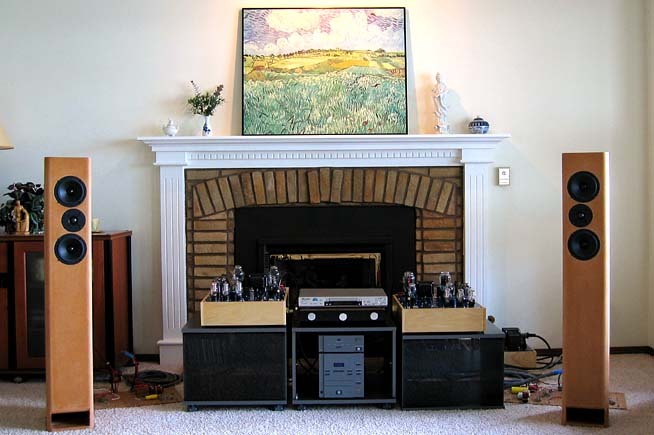 The new Karna amplifiers, designed by Lynn Olson and built by Gary Pimm. Bent Audio/Noh transformer volume control, and the original Ariel speakers. Many years ago when I was designing the Amity, Takuji Yamamoto of the Direct Heating Society of Japan urged me to try direct-heated drivers for the 300B tubes. Although the Amity ended up sounding different than the Sakuma-method amplifiers - more "American" in style - I very much appreciate Sakuma-san's poetic approach to amplifier building. I never forgot Takuji's comment that getting the "tone" right on a 300B required a Direct-Heated-Triode driver. Putting on my Tektronix hat, DHT's have remarkably low distortion compared to nearly any other tube, and peak-current capability is far in excess of more conventional drivers. DHT's just sound better, more natural, more clear, and most of all, more emotionally engaging. "Presence" and "vividness" are the impressions that come to mind. But the inevitable awkwardness of AC hum induction, microphonics, more complex power supply, etc. etc. kept me back from looking into it. I went through the Raven and Aurora before even considering it. At an intuitive level, the idea of a three-stage amplifier composed of an input 5687/7044/7119 driving another 5687/7044/7119 driver somehow just felt wrong. Vacuum tubes are good at doing different things; a driver is not at all the same application as an input tube, which is really a preamp-style voltage amplifier and input buffer. Driver tubes have to confront the shock of power-tube grid-current whenever the amp clips, which happens more often than people think. They also have to deliver a massive voltage swing to the power-tube grids - more than two or three times the swing required by pentodes, combined with a heavy capacitive load. In the Karna, each VV32B (or equivalent) is biased at 100V; this means 282 rms volts of drive are required for the pair, and at low distortion - preferably less than the 0.3% distortion of the VV32B's themselves. This is a tall order for any driver. By the way, that's why high-end DHT amplifiers are sonically all over the place - very few have sufficient drive capability in the driver stage. Instead of hearing the transparency and directness of the DHT power tube, you hear an overloaded RC-coupled driver instead. All of this stayed on the back burner until Kevin Carter of K&K Audio told me about building an amplifier that used a pair of PP 2A3 driver tubes instead of 5687/7044/7119's. His approach was a little different than what I was considering - he used direct coupling with center-tapped choke loading - but that it worked at all was interesting. Part of what kept hum reasonable was the low gain of the 2A3 driver. I was still reluctant to try DC heating after the disastrous experience with trying it in the 300B output section, so hearing from Kevin that hum levels were acceptable was reassuring. 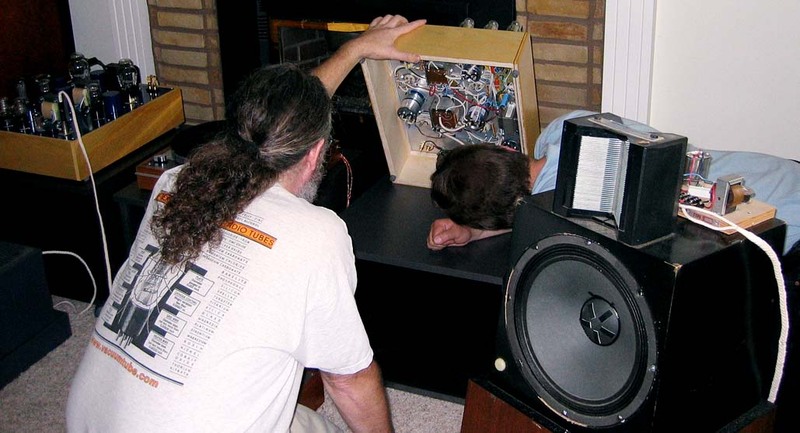 Kevin was the second person in the USA to build an Amity-style amplifier (and he already owned a pair of Ariel speakers), so I took his experience seriously. I planned on using current sources combined with VR-tube shunt regulators to fully isolate the input and driver stages, along with the Western Electric bypass between the center-tap of the transformer and the common-cathode circuit of the tubes. This keeps the AC path from plate to cathode as short as possible, and minimizes the audio currents going through the shunt regulator. The direct signal path comes down to wire, transformers, and triodes; there are some indirect paths using bypass caps, but these carry only small imbalance currents. The most colored-sounding (and highest-distortion) triode is the input section - the choice between a 5687, 7044, 7119, 6H30, or other similar triode is essentially a subjective choice. You can't use just any triode in this location: for example the plate-to-plate impedance of the otherwise excellent 6SN7 would limit the bandwidth of the first interstage transformer to below hi-fi levels (less than 50 Hz ~ 15 kHz, in other words). The Lundahl transformers remain good choices for the input, interstage, and output as well, and have exceptionally good balance and bandwidth (in excess of 75 kHz). I'm currently using a Tribute input/phase splitter transformer, and don't have the nerve to ask for a custom interstage transformer - these things are extremely difficult to design, expensive to build, and have a small market. I'm just appreciative the O-Netics and Lundahls are out there. The sheer weight of all those transformers, combined with isolating the emission of the power transformers from the susceptance of the audio transformers, made a two-chassis design a good idea. It does have the drawback that grounding requirements become pretty subtle. Fortunately, Gary Pimm was the one to build the amplifiers, and he's pretty familiar with instrumentation-style grounding. So I could follow what he was doing, he recommended I buy a copy of Ralph Morrison's Grounding and Shielding Techniques in Instrumentation, which is pretty much the Bible in the subject. Before you get too lost, a good place to start is simply put the word "grounding" out of your mind, and think instead of return paths for current. In this amplifier, there are two: the audio-signal return path, which flows from plate to cathode, and the DC return path, which powers the tubes, and ideally carries no audio at all. Thirdly, there's the connection to the chassis, which only occurs at one point in the circuit, and carries neither audio-frequency nor DC currents. Note the power supply actually floats, with only the cases of the power transformers connected to the chassis. There are separate DC returns for each section of the circuit, as well as full isolation of the 400V and 520V supplies. The audio-signal returns are physically small in area (small loop area). Similarly, the loop area of each rectifier circuit is small, which reduces emission of hum and noise into the rest of the amplifier. Since the loop area acts like an antenna, keeping it as small as practical (limited by heat considerations of the tubes) reduces noise pick-up and emission. By separating the audio-frequency return currents, the DC currents needed to run each stage of the amplifier, and the single connection to chassis ground, there's a substantial reduction in hum, noise, and background noise. Since the actual circuit has very low distortion and low intrinsic noise, it takes an instrumentation-style layout to realize the full benefit. In fact, even though all heaters and filaments are AC heated, the Karna is very quiet on 107dB/metre Avante-Garde Trios, with only a slight hum (audible no more than 1 foot away), no buzz at all, and just the faint hiss of the tubes themselves. Even on the Trios, the backgrounds are inky-dark and silent, not what you expect from a DHT amplifier. Instrumentation layout and grounding are probably even more important for DHT amplifiers than other types, since the intrinsic distortion is so low, and you can hear so far into the music. At some point, I'd like to explore DC heating for the driver and output stage, but it isn't trivial to solve the problems of isolation from AC -> DC rectification noise, avoiding coloration from the DC heater supply regulators/capacitors, while also taking advantage of the DHT's intrinsic 40 to 50 dB of differential noise reduction. Almost every DC-powering technique I've seen introduces subtle new colorations of their own, or fails to completely isolate the filament from the very high levels of switch-noise from the AC -> DC rectifiers. The DHT filament is carrying out three separate functions at once: it's an input node for the tube (the tube amplifies the voltage difference between grid and cathode), it carries the audio-frequency return currents that flow from plate to cathode, and last but not least, it heats the filament so it can emit electrons. The virtual cathode isn't a real connection that appears on a circuit pin; instead, it appears at the electrical center of the filament. If the audio-frequency return currents are connected to one side of the filament instead of the virtual center, then 40 to 50 dB of AC noise rejection of the filament is thrown away for no good reason. The distortion from the DHT driver is far lower than any IDHT tube tried - in fact, the distortion from the 45 is so low it cannot be distinguished from the signal coming from the input stage - with measuring equipment with a noise floor of -130dB. In this amplifier almost all of the distortion from the 4th harmonic on up is coming from the input stage, not the driver, nor the output tubes. Direct-heated triodes, especially the 45 and 300B, have extremely low distortion. The sonic result is vivid tone colors and remarkably transparent sound, limited only by the sonics of the transformers. I've tried the Lundahl's, which work well, and O-Netics are next on the menu. The most important requirement for the interstage transformers is a precise phase match between the secondaries - with no more than a few degrees of deviation - from 20 to 50 kHz. This can be confirmed by using a X-Y display on an oscilloscope, connecting one secondary to the X axis, the other secondary to the Y axis, and sweeping the transformer from 1 kHz to 100 kHz. The display should stay very close to a straight line, and only "open up" very slightly. I was curious just how robust a DHT driver was - well, the driver can drive the 300B grids 30 volts (!) positive, with no crossover glitch as it passes from Class A1 to Class A2. In Class A1, it delivers 15 watts at 0.3% distortion, and A2, it delivers 30 watts at 3% distortion. The driver is so powerful it doesn't mind the onset of power-tube grid-current, and the 300B stays linear as it enters the positive-grid region. The best-sounding drivers are old-stock 45's run at 28mA each, middle of the pack are NOS American triode-connected 6W6's, and the least impressive are new Sovtek 2A3's (at any current). You get what you pay for, I guess. Haven't tried the Chinese or Czech mesh-plates so far, although they have excellent reputations in the 2-watt SE world. This gives the amplifier the subjective headroom of a 30 to 100-watt amplifier, not what you'd expect from 300B's. I can tell you, with the Azzolino or Avante-Garde horns, the dynamic range and sheer bass power is truly frightening. You do not want to get clumsy with interconnects with this amplifier. The input has a three-way rotary switch, which takes advantage of transformer coupling to offer normal phase, reverse-phase, and muting positions. This comes in handy for auditioning new equipment, quick interconnect changes, and checking to see if reversing the phase (of both channels) sounds better with a given recording (very recording and system-dependent). Gary Pimm and Gary Dahl (relaxing next to window) relaxing in my living room after delivering the just-completed Karna amplifiers. Mr. Pimm had been fine-tuning the amplifiers in Portland over the last three weeks, and was so impressed that he brought his complete system up here. Gary P brought his Thorens/Grado phonograph, his superb phono stage, the Dave Slagle autoformer volume control, handmade cotton/litzwire cable, and Gary P's Klipsch/Heil speakers (modified Heresy woofer and crossover, AMT-1 box, modified passive radiator, and AMT-1 Heil tweeter). Although you might expect the worst from a Klipsch Heresy and a Heil tweeter, the 12" Klipsch woofer, modified Klipsch crossover, and Heil tweeter actually work very well together, giving dynamic and quick sound, and remarkably smooth response (+/- 2dB, not bad eh?). 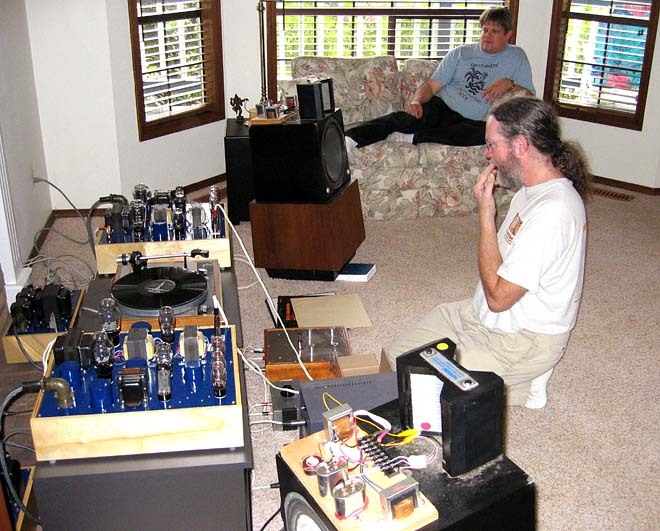 Here's Gary Pimm (left) showing Gary Dahl (right) the layout of the Karna amplifiers, with Lundahl transformers underneath, O-Netics on top, Litzwire audio and power-supply wiring with cotton sleeving over high-voltage test probe insulation. The upstairs/downstairs dual-transformer layout was Gary's idea, so we could easily compare and switch between two types of input, interstage 1, interstage 2, and output transformers. In this picture, you can see the Stewart & Billington TX102 Mk III transformer volume control (TVC) set up for +6dB gain, followed by the Sowter 3575 for the input and phase-splitter, Lundahl interstages, and Bud Purvine's (O-Netics) Level 1 output transformer. Since their first arrival at the end of summer, the Karna's made a weekend visit to Gary Pimm's for a fine-tuning session. The picture below shows the latest 1.1 version of the Karna amplifier - a RCA input and ground-lift switch has been added, and the Bud Purvine O-Netics interstage transformers are below decks. On the left side of the picture, directly behind the middle VR tube, you can see the DPDT toggle switch that sets the quiescent current for the driver stage, allowing direct comparison between 45 and 2A3 driver tubes. Near the front of the amplifier, a 5-position input selector allows a choice of two input transformers, muting, and phase inversion. The ground-lift switch is behind the RCA input. A few inches behind the input selector you can see the very small hum-nulling control, which is a screwdriver-settable 10-turn pot. On the 92dB/metre Ariels, you can just barely hear it with your ears 3" away from the woofer cones - any distance more than that, it goes away. It's quiet enough that adjusting the hum-nulling pot is a little awkward - the hum isn't audible when you're leaning over the amplifier making the adjustment. The first experiment for the 1.1 version was neutralization of the 5687/7044/7119 input stage; this consists of cross-connecting a small (a few pF) capacitor from one plate to the grid of the opposing tube, and vice versa. This has the technical advantage of cancelling the Miller capacitance of the input stage, making the amplifier an easier load for the preamp, and speeding up the input stage as well. A "free lunch", as it were. Nice in theory, a disaster in practice. Any value beyond 4.4pF resulted in full-power oscillation at some high frequency - hard to interpret on the digital scope, but Gary and I were guessing it was 20 to 50MHz or higher. 3pF would be a "safe" value for neutralization, but that's such a miniscule capacitance that you could get that just from sloppy layout. In fact, the onset of oscillation with 4.4pF of cross-coupling is a warning to keep the wiring point-to-point, going straight from the associated transformer to the relevant grid and plate. In this amplifier, as in the Karna, neutralization does not work. Don't bother. 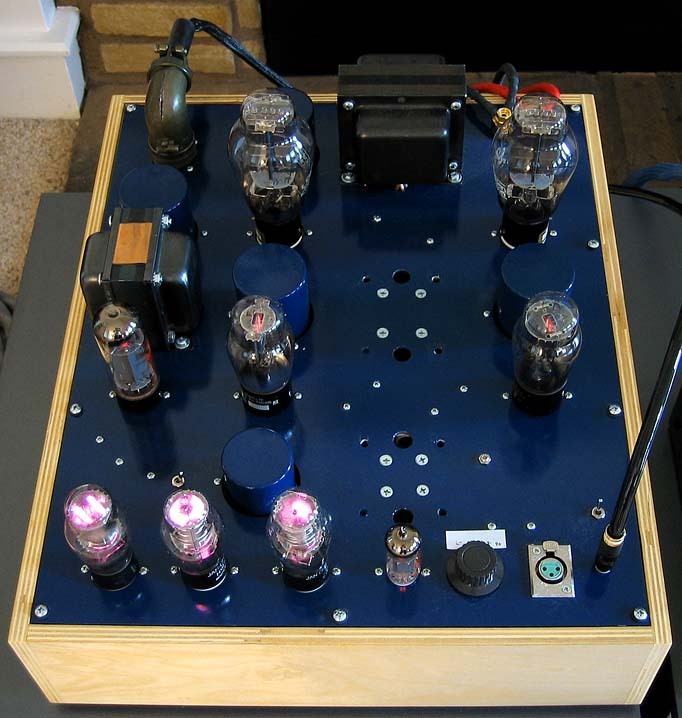 I received a tip from John Atwood, the previous Technical Editor at Vacuum Tube Valley, the 6W6 is a "sleeper" tube that makes a great driver, very low distortion, really reasonable price, and readily available. How can I resist at $2.85 apiece from Antique Electronics? Well, after testing for distortion, beware the Japanese variant of the 6W6, which has more gain and 15 to 20dB more upper-harmonic distortion than the genuine article. The old-stock American and Italian versions were OK in performance, maybe a little worse than a 2A3, but certainly usable. Since these are indirect-heated pentodes (triode-connected for this application), it saves worrying about with the 2.5VAC filament supply and using the hum-cancelling circuit of the Karna driver stage. Conveniently, the 6W6 uses an octal socket with the standard 6L6/EL34/KT88 pinout, so you can substitute any power pentode you like and listen for your favorite flavor of sound. The biasing is also the same as the 45 (in fact the overall specs are similar to a 45 in terms of dissipation and recommended plate current), so the audio circuit can be left at the 45 operating points. Replace the UX4 4-pin socket for the same-size octal socket, connect the screen directly to the plate, provide 2.4 amps of 6.3VAC heater current for the pair of tubes, and off you go. Returning to direct-heated territory, Gary and I compared old-stock RCA 2A3's (might as well use the genuine article, right?) with old-stock 45's. Although 2nd and 3rd harmonic distortion levels were similar, the NOS 2A3 unfortunately had 5 to 10dB more of the 4th, 5th, 6th, 7th, 8th, and 9th harmonics than the 45 triode. By comparison, the distortion from the 45 triode was unmeasurable, since overlaying the 5687/7044/7119 profile with the 5687/7044/7119 + 45 profile showed identical spectral curves, with no visible difference at all between the two. With every other driver - the 2A3, the different flavor 6W6's, etc. the 5687/7044/7119+driver curves showed more distortion than the 5687/7044/7119 by itself, which is what you would expect. It should be mentioned that the raw THD figure is quite misleading, since it is usually dominated by the 2nd harmonic, even in Class A PP circuits. 2nd harmonic, by itself, is nearly inaudible, since it is a full octave higher than the original musical spectra, and is musically consonant. Similarly, the 4th harmonic is two octaves higher, and is also musically consonant. But 3rd, 5th, 6th, 7th, and 9th are very dissonant and ugly sounding, and are easily heard, especially with increasing order. In the 1950's, both Norm Crowhurst and D.E.L. Shorter (of the BBC) proposed weighting harmonics by the square or cube root of the order to better reflect their audibility. Small amounts of high-order harmonics - even when 60 to 100 dB down - are musically significant. The high-order harmonics - 3rd on up - were where differences between drivers were easily seen on the FFT analyzer. The 45 was cleanest, in fact indistinguishable from the input tube driving it. The old-stock 2A3's came next, followed by the (genuine) 6W6's. Since the 5687/7044/7119 was delivering 20V rms per plate during these tests, using it as a driver (like the Amity and Aurora) would obviously have more distortion, since it would have to deliver between 60V and 70V rms per plate to drive the 300B or 320B-XLS. As medium-gain, medium-current triodes go, the 5687/7044/7119 familiy are one of the lower-distortion ones out there - but not in the same league as DHT power tubes. Are there any tubes with gains of 20 or more that have lower distortion than the 5687/7044/7119 group, particularly in the upper harmonics? Good question, since the 5687/7044/7119 group have a more favorable distribution of harmonics than most other medium-gain tubes. This leaves the tube lineup of input=6H30 or 5687/7044/7119, driver=45, output=300B or 320B-XLS as the best for the Karna amplifier. I've yet to evaluate the 45 and 2A3 mesh-plate exotics from China and the Czech Republic.